The new IPR-10G2-HDMI and IPR-10G2-SDI converters are capable of bridging 10-bit HD IP video signals to HDMI and SDI. The AJA Video IPR-10G2-HDMI supports monitoring of SMPTE ST 2110 signals via HDMI up to HD 60p and includes a full-size HDMI 1.4b video output with up to 8-channels of embedded audio. IPR-10G2-SDI provides SMPTE ST 2110 monitoring up to HD 60p via dual mirrored 3G-SDI outputs, with up to 16-channels of embedded audio. 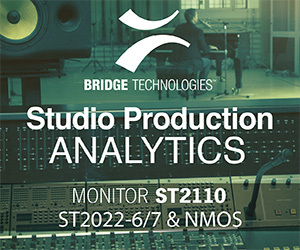 Both models are designed for green-field SMPTE ST 2110 facilities, or existing baseband environments including master control, trucks or edit suites. The IPR-10G2-HDMI and IPR-10G2-SDI are now available through AJA’s worldwide reseller network for $1295 US MSRP each. They will also be featured at the 2019 NAB Show.